Home ⎢Shifting Baseline Syndrome: Are you afflicted? It’s early afternoon. The sun is beating down and mosquitoes are humming. Another decent day’s catch is unloaded, men sweating with the effort. If it weren’t for the breeze, the stench would be unbearable. Today’s tally: more than 100 sharks, some weighing close to 1,000 pounds and reaching nearly 20 feet in length. The catch includes leopard (tiger), dusky, hammerhead, nurse, sand sharks and sawfish—nothing unusual in the shallow (15 feet) waters surrounding Big Pine Key. For those who are familiar with Big Pine Key and know that it is located in the middle of the Florida Keys in the southeastern United States, you may be thinking that this story is made up. Yes, you have seen some sharks in the Florida Keys, possibly more than you have seen elsewhere, but not 100 in one day. And definitely not the combination of species mentioned. Unfortunately, you’re right. A story like this could not be told today, and with good reason, because it describes a scene from the 1920s, commonly documented in newspapers and other publications of the day. To seasoned divers and fishers that know the local shark ‘hotspots’ around the world, it may seem like there are a lot of sharks still living today—to see them, one just needs to know where to look! However, in most places there are dramatically fewer sharks than there were just a few decades ago. In fact, what most of us don’t realize is that what we expect to see on even the very best dive may be quite different from what our parents or grandparents would have seen a generation or two ago in the same location. This change in perspective is referred to as the shifting baseline syndrome where an individual’s baseline is the perceived natural condition of an environment based on their first visit, photographs or descriptions. This problem recognized by Jackson was first identified by fellow marine biologist, Daniel Pauly, in a 1995 article in the journal, Trends in Ecology and Evolution. The perception of what we see in the water today (or at any point during one’s lifetime) can sometimes be mistaken for what is natural. What is within one’s living memory, or the living memory of those around them, is a ‘baseline’ against which they compare other experiences. But does it really matter how a specific marine animal population has changed over time? As Pauly and Jackson identify in their writings, the problem comes when these shifting baselines are the norm rather than the exception, and when this shift in perspective begins to affect not only an individual’s perception but the statistics used for policy creation and conservation measures. How can realistic catch limits or recovery targets be made for the management and conservation of marine species, like sharks, if we don’t know what the ‘natural’ or ‘pristine’ abundance of sharks used to be? Or if the reference points we use today are ten or one-hundred times less than the actual numbers really were? The current state of North Atlantic baleen whale populations, including humpback, fin and minke whales, demonstrates the importance of reconstructing accurate baselines for marine animal populations. The current baleen whale population is ~214,000-217,000. These populations were thought to be recovered and close to carrying capacity until 2003, when Joe Roman and Stephen Palumbi published a novel study in the journal, Science. Using DNA analysis, this study showed that current populations are a small fraction of the past numbers, which are estimated at 865,000 for these three species in the North Atlantic. Unfortunately, the shifting baseline syndrome not only affects our perception of abundance but also the size and variety of species seen. Fishers proudly posing with their ‘trophies’ following sport fishing events provide valuable insight into this change in perception. Loren McClenachan and colleagues, in a 2008 paper in the journal, Conservation Biology, used historical trophy-fish photographs in the Florida Keys dating back to the 1950s. This study showed that the average size of trophy fish declined substantially between the ‘50s and the present day. The average length of sharks caught dropped from 195cm in the 1950-60s to just 91cm in 2007—that’s 100cm shorter than just half a century ago! This same study also revealed changes in the types of sharks caught over the years. Of the 16 individual sharks caught and photographed between 1956 and 1960, there were four hammerheads and three great white sharks. But between 1965 and 1979, there was only one hammerhead and one great white shark caught, though the same total number of sharks was photographed. In 2007, no large sharks were caught, and there was a shift to small, immature sharpnose, reef and bonnethead sharks. 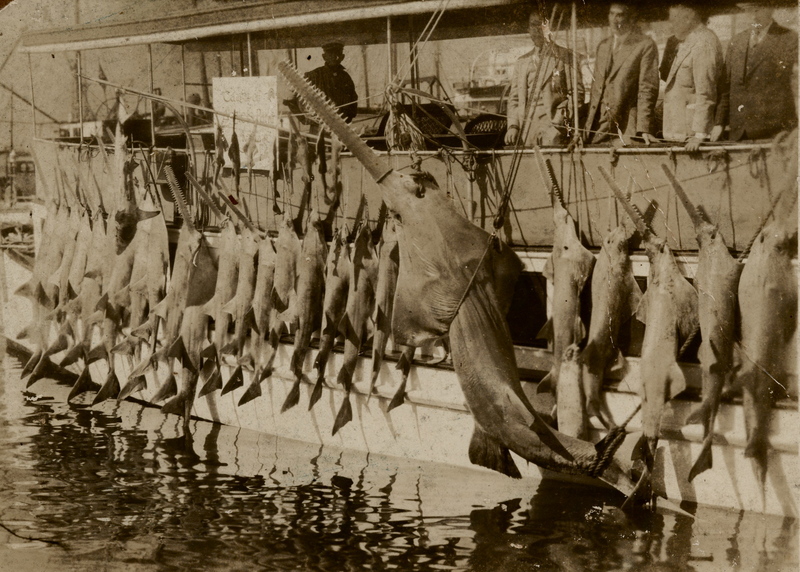 Ironically, those proudly displaying their almost two-meter-long catches including hammerheads and great whites as trophies in the 1950s were likely also victims of the shifting baseline syndrome, since heavy exploitation undoubtedly had an impact on the ecosystem much earlier. For example, as described in the opening paragraph, in the 1920s, a shark processing facility on Big Pine Key operated for several decades, with 50 or more sharks caught and killed every day for products such as leather, fertilizer and shark oil. Other commercial fishing operations for reef sharks also operated in the area in the 1930s-40s. And for centuries before that, the fishing communities of the Florida Keys were subjected to commercial, recreational and subsistence fishing by Native Americans and Europeans. Although the shifting baseline syndrome does not necessarily signify a loss in number or size, it is unfortunate that most shifts observed the world over are overwhelmingly declines. In 2003, scientists Ransom Myers and Boris Worm published a paper in the journal, Nature, showing a 90 percent decline in large predatory fish biomass over the last 50 years in the oceans globally. The same year in Science, Julia Baum and colleagues showed that within just 15 years, with the exception of mako sharks, all recorded sharks species declined in abundance by at least 50 percent and that several large pelagic and coastal shark species declined by more than 75 percent in the Northwest Atlantic. The Mediterranean Sea provides another example. Francesco Ferretti and colleagues published a paper in Conservation Biology in 2008 showing that hammerhead, blue, shortfin mako, porbeagle and thresher sharks have all declined between 96 and 99.99 percent relative to their abundance before human impact; therefore, these sharks now only occur at less than five percent of their original abundance. Sadly, the loss of marine predators, of which sharks form a large percentage, has been a global phenomenon. In addition to chronicling the declines of sharks, scientists are increasingly demonstrating their importance in the functioning of marine ecosystems. The loss of sharks has been shown to cause cascading effects that change marine life across several trophic levels and has resulted in the destruction of economically important fisheries. Plus, the problem of declining shark populations is exacerbated by the fact that sharks are slow to recover, due to their low reproductive rates (they produce relatively few young), meaning that their ability to compensate for low population size dramatically slows their recovery time. In addition to their ecosystem importance, sharks provide a valuable source of food protein and income from tourism for millions of people around the world—the majority of whom are impoverished. Plus, as divers, we too benefit from healthy shark populations—we love to see sharks and other large fish in their natural environments and will pay top dollar for the opportunity to do so. For all these reasons, promoting healthy shark populations by preventing overexploitation and prohibiting illegal poaching is essential.